If you follow CRAFT, as well, you may have seen Rachel’s post back in January about Oregon jeweler Shannon Conrad’s interlocking Lego rings. 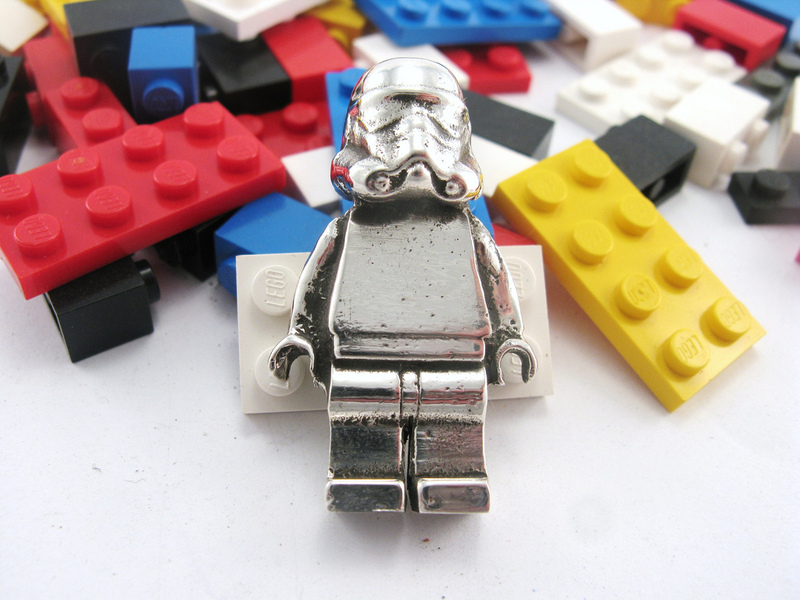 Shown above is the result of Shannon’s very first experiment with casting from Lego elements, a one-off solid silver Imperial Stormtrooper minifig she made for her 11-year-old son. It weighs 1.5 oz (44g). I know Lego fanboys who happily would trade their own teeth for one of those. Interlocking Rings – Set of 2. Sandcast and soldered sterling silver with brushed black patina. 2 x 2 Building Block Cufflinks. Sandcast and soldered sterling silver with brushed black patina. 2 x 2 Building Block Ring. Sandcast and soldered sterling silver with brushed black patina. Protecting the environment is an issue that is very important to me. To that end, I am careful about the choices I make in sourcing materials as well as the processes used to make my jewelry line. All of the sheet and wire used in my work is made up of 100% recycled silver. Additionally, I have chosen non-toxic, environmentally friendly alternatives for use in the studio – citric acid pickle, bio-degradable flux and lead-free enamels. Little things make a big difference! If you’re in the area, you can find her work for sale at local stores Presents of Mind, fuschia, and REDUX. Shannon has published a brief phototutorial for those curious about her sandcasting process.